What Is The Best Kind Of Exercise For Your Pup? Check Out This Informative Video! German Shepherd pups, as any Mom and Dad can tell you, are incredibly loyal and intelligent working pups! With their breed heritage comes plenty of energy that you will want to burn off efficiently. Problem is, with a pup this smart, how do you trick them into exercising? Some people are happy to share with you the answer! 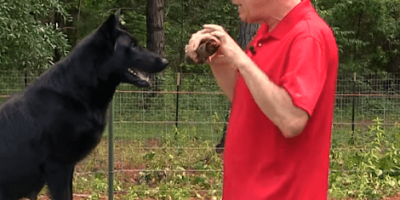 The German Shepherd Man is a pup trainer who specializes in dealing with German Shepherds, and his enthusiasm shows in every moment he spends with a pup! Considering he has over forty years of experience with these majestic pups, he is probably the happiest man in the world! In this video, he shares several tricks and tips with his audience about the care of German Shepherds. Not only does he discuss energy levels during different times of the day, but he also explains a common, fatal problem that can happen to these wonderful pups, and how parents can avoid it! Watch How This Adorable Pup Refuses To Let Dad Touch His Precious Ball!